I have decided to do a detailed post on what is probably the most certain indicator of a coming cold winter that I have found in all my years of research. This is based on a climate index I developed a few years back that I call the North Pacific surface pressure index (NPS). Nine out of ten years this index has been +2 or above for the month of October, the following winter was cold with at least one major Arctic outbreak. Even the one year that didn’t deliver a great winter (2001-02) had some cold air intrusions in late January and March, with areas from Everett northward having a solid winter. While it is not certain this month will achieve the +2 threshold, it is very likely as the month to date number is sitting at over +4 with prospects for the next week to 10 days being strongly positive. A few years ago I developed this index which denotes the surface pressure anomalies over the NE Pacific at two locations (35N – 135W and 45N – 150W). The former is close to the climatological center of the semi permanent NE Pacific surface high pressure cell, and the latter location is a region that is very important to modulating temperature anomalies over the Pacific Northwest. The index is derived by taking the surface pressure anomalies at both locations and taking the average of both readings. I have calculated the monthly totals of this index for every month back to 1948. The map below shows where these coordinates are. The cold / positive phase of the NPS is marked by abnormally high surface pressure over the region in question. The composite map below shows a typical example of the NPS in its positive phase. This phase is often associated with northerly or NW flow and below normal temperatures over the PNW. The warm / negative phase of the NPS is marked by abnormally low surface pressure over the region in question. The composite map below shows a typical example of the NPS in its negative phase. This phase is often associated with south or SW flow and above normal temperatures over the PNW. The tables showing the monthly NPS values are below. They were derived from monthly reanalysis data of monthly surface pressure anomalies at the aforementioned locations. The years listed below are the seasons that featured an October NPS reading of +2 or higher and the extreme minimums for the following winter at SEA, and for Landsburg (figures in parenthesis). All winters featured significant snowfall in at least parts of the Puget Sound region, including 2001-02 which had decent snowfall from Everett northward. Quite an amazing feat considering this group of years is based on just one criteria. It’s also remarkable that many of these winters had 2 or more significant Arctic outbreaks. Good stuff! Question though - don't you think the PNA already captures the pressure anomalies pretty well? Good point. It does to some extent, but I've never seen such strong correlation for using it to forecast a few months ahead. BTW I was also going to mention the NPS has a huge bearing on the PDO. A persistent positive NPS will normally drive the PDO negative. Seems to go in line with the troughy Nina/neutral Octobers being a good omen theory. I can certainly see the connection in 2007-08. I believe the old NPI (North Pacific Index) captures a lot of the same pressure tendencies you're referring to here. I remember when you developed this. As other have pointed out, I do think there is some merit to this idea. Often when this type of pattern can persistently develop in the fall it continues in the winter, meaning a -PDO/PNA type pattern with a better bet for arctic blasts. This is also similar to the LRC cycle which works some years. Based on this, I believe we have an elevated change for arctic intrusions this winter. The tables showing the monthly NPS values are below. They were derived from monthly reanalysis data of monthly surface pressure anomalies at the aforementioned locations. You will notice that October 2008 is shown over +2, that is due to the fact I made the image in November 2008 and the data was preliminary. I will post an image of the NPS values for the end of 2008 through present in the next few days. October 2013 had a value of 2.30. How much do values effect summer time temperatures? For sure. That seems to be the bottom line with this. The number for the first third of October is a whopping +5.65. There have been 20 to 25mb anoms at 45N - 150W over the last few days. That being said, the correlation is very clear. The winters with the highest overall number: 1971-72, 1948-49, 1949-50, 1988-89, 1956-57...all winters with major Arctic air outbreaks. Good stuff SnowWiz, I hope this indicie gets the attention of a few mets. I guess I can say goodbye to my winter. This is definitely not a good scenario for your area. Usually we get an El Nino JUST after the bottom of the solar cycle. The East usually gets pounded with those. Yeah, we probably have to wait another year or two before cold/snowy winters return here. Our blowtorch winters usually come in bunches of two or three, so this could be our third and final torch in this stretch. True. Certainly no index that always tells you everything, but the correlation is there as you said. How will the Central Coast of California do this upcoming Winter? Will it be wet, but colder than last Winter. I'll run some composite maps and let you know. Thanks! I am really excited about this right now. At the rate we're going we could easily end up with an October value over +3.. All of the years that were 3 or higher in October led to multiple Arctic blasts. There is definitely something to this. Interesting that so many of the +3 Octobers occurred during +QBO years. The only -QBO October meeting your aforementioned criteria is 1956/57. I could really sink my teeth into that analog. That October certainly had weather like this. Yeah, 1956 had a chilly October. PDX didn't get above 65 after 10/9 for the rest of the year, or above 60 after 10/19. Both dates are records here. Thank you and I enjoy reading your weather analysis! The month to date number is now +6.7. The amomaly at 45N - 150W on the 11th was an insane 27mb! We are into crazy territory here guys. Today's 0z GFS shows an overall positive NPS regime over the next week to 10 days at least. We should end up with a really good number this month. Sounds like the record from 1961 could be in jeopardy. It sure could be. That was another winter that had multiple Arctic blasts. In fact every winter following an October that had an NPS above 3 had more than one blast. The NPS through October 13 is now up to +8.2. The anomalies at 150 have been insane! Now if only the American forecasting systems and the powers to be behind the face of NOAA were this intuitive, they may actually get a long range forecast correct. Good work snow_wizard, I’ve aleays taken interest in the way you predict weather. Analogs and past weather/climo are the best way to predict upcoming weather. I doubt this winter will be colder than last regionwide at least in Dec/Jan. However, I do think Feb/Mar will be significantly cooler. I am going to post my thoughts on winter soon! January could be colder I think. It is by far the coldest/blockiest month on the analogs I'm looking at. December looks wishy-washy and highly variable to me, but I do see an anti-cyclonic wavebreak over Alaska sometime that month, so there could be some Arctic air nearby. I'm just not sure where how the wavebreak/trough will orient itself..hard to forecast something like that out in advance. Last January is a tough act to follow. It was the coldest in 35 years for much of the region. To beat it would take a January 1949/January 1950 type of sequence. I wonder how much of that can be attributed to January's relative suckage up there since 1980? Then again I'm only looking mid/upper level data (thermals/heights from 850mb to 500mb) so maybe things work differently at the surface. That's not something I'm well-versed in. Either way, from an upper level standpoint, I'd give this January a 50/50 chance of being the coldest since 1980. 1) PV dies too early = winter peaks in December and coldest air slides East of the Rockies in January following MJO propagation into WHEM. 2) PV dies too late = 2007/08 repeat at best, as mid/late winter climo forcing response favors +EPO/firehose while cold slides into Eurasia. I wonder how much of that can be attributed to January's relative suckage up there since 1980? Then again I'm only looking mid/upper level data (thermals/heights from 850mb to 500mb) so maybe things work differently at the surface. That's not something I'm well-versed in. Either way, from an upper level standpoint, I'd give this January a 50/50 chance of being the coldest since 1980, depending on the extent to which we can perturb the PV in December (which means we want to castrate it next month, but avoid killing it until the Holidays). PV dies too early = winter peaks in December and coldest air slides East of the Rockies in January following MJO propagation into WHEM. PV dies too late = 2007/08 repeat at best, as mid/late winter climo forcing response favors +EPO/firehose while cold slides into Eurasia. I should have said coldest in over 35 years. I believe 1979 was the last one that was as cold on a regional level (including eastern Oregon and Washington). Ah, gotcha. The NCEP-NCAR re-analysis extends back into the late 1940s, but it's not very useful from a surface standpoint. So that's something you'd have better knowledge of than me. If this were a +QBO winter with an east-based Niña/tight WC, I'd probably be more bullish than I am right now. From an upper level standpoint, there were at least two Januaries colder than 2017 since the start of the satellite era, and obviously there were much colder Januaries back in the blocky 1950-1980 era. I'm not sure if we'll be able to surpass 1979 this year, as I don't think we're quite ready to return to the 1950s circulation, but who knows...the stars could align. You're already going pretty bullish if you are predicting a colder January than last year! Last January was a beast. The Willamette Valley ran a -5.2 anomaly and the east side was even colder. The north-central OR division posted a -9.6 anomaly, northeast -9.4, south-central -8.2, and southeast OR -8.2. Not saying back to backs aren't possible. We have a great example with 1949 and 1950 in our region. It's just a question of odds. Yeah, given recent history, I think your skepticism is probably the wise choice. Heck, I'm somewhat skeptical of myself here, but the last time I disavowed my own data, I got burned. To be clear, I'm not actually sure that January will be colder than last year. I do think, if the aforementioned high latitude processes can play out *perfectly*, then it will make a serious run for the coldest January observed since (at least) the 1970s. That's not something I'm actually "predicting" per se, however we're preconditioning the system state in a very interesting way right now. By biggest worry is that we blow our load too early. But yeah, it's always a challenge to perfectly time the destruction of the PV with the proper MJO/SS-integral. We haven't come close to accomplishing it since the 1990s, both due to bad luck and poor low frequency preconditioning. This is changing quickly now, though, so we'll see! Yeah, and the only other example of back to backs remotely close to 1949-50 is 1979-80. At least in the modern era. This was all just with sustained moderate to high end cold, too. No real strong arctic blasts last January (at least with the PNW in the crosshairs). More a steady diet of modified cold air and a very suppressed southern jet. I could buy the argument that we could see a stronger stand alone blast (or two) next January, despite a slightly warmer overall monthly average for the region. Very interesting. I've wondered what exactly caused the lack of uber-top tier cold waves since 1996, compared to a feast of them between 1977-96. We could certainly have a more impressive 500mb anomaly nearby as well, but not close enough to produce for us. Thinking of January 2005 and 2008. 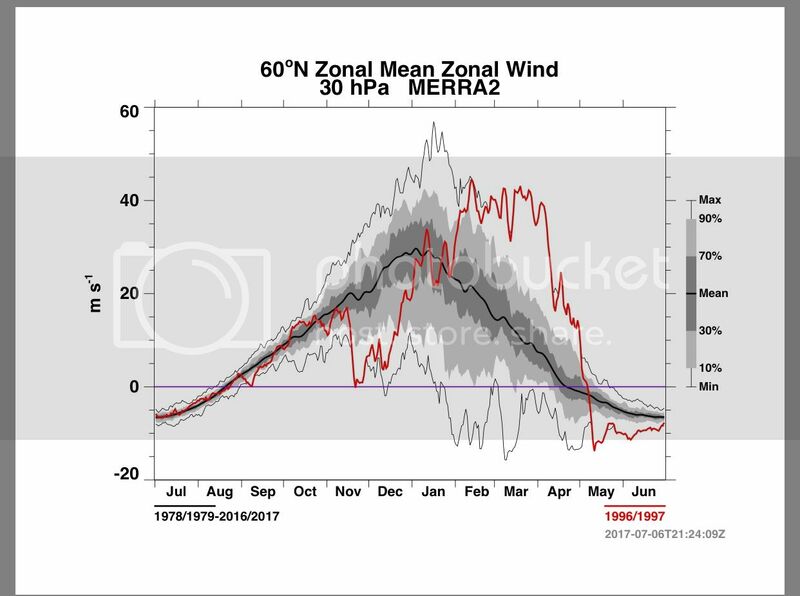 A long lead forecast of significantly negative 500mb heights over our heads only has to be off by a few hundred km's to totally screw us. Yeah, 850's never dropped below -9.3c over SLE last January, and that was in the earlier airmass during the first week of the month. We were sort of on the fringe of that one. Our coldest 850's actually occurred in mid-December at around -10c. Good point. I'm seeing at least one top tier blast this winter. The high pressure over the NE Pacific this month is unprecedented in the modern era. The table is set for something highly unusual. Yeah, it all started with the ridiculous PV progression during the late fall/early winter of 1996/97, which culminated in two magnificent MJO events which brought on the super-niño and subsequent climate shift. The absurd strength of the PV in March/April (thanks to the early season SSW in November of 1996) preconditioned the system for the strongest Final Warming event in recorded history. This produced a mammoth MJO response that single handedly terminated the Niña regime and ignited the super niño process within just three weeks. This was perhaps the most magnificent display of abrupt climate change we've ever observed. Still, I mostly refuse to believe that abrupt system-state shifts like this can be "produced" on a whim by cold season SSW/MJO events. I think these are simply the conduits through which systematic re-equilibration is obtained. The new climate system state that followed the 1997/98 El Niño is still with us today..very hard to believe that a bizarre stratwarm event could singlehandedly unlock a new climate state. Otherwise, our climate system is more unstable than we ever thought possible. Still..the nagging question is: What would have happened had that SSW not occurred? What would the climate look like today? Fun to ponder, IMO. Indeed. I've read before that the transition from the super Nino to La Nina in 1998 was also remarkably abrupt. Am I remembering right? Do you have any thoughts on that? Let's see how the NPI lines up with your index. A lot of similar years (1956, 1961, 1971, 1972, 1985, 1990, 2008), but also some notable differences (1958, 1982, 1989). And 1949 is nowhere to be found on this list. I think a couple things are clear. 1) Both lists feature following winters with high levels of blocking and quite a few major Arctic blasts, and 2) weakly -ENSO/neutral years are disproportionately represented. 8/12 of the years above fall into that category. That is quite interesting. I like how my index weeds out the relatively weak years like 1958 and 1982. It was definitely abrupt, perhaps even more-so. Though I'd argue that it was the super El Niño itself that brought on that prolonged La Niña. Long post here, so I'm sorry if I'm stating the obvious. Basically, these strong/super ENSO events can be thought of as water sloshing back/forth in a bathtub. Climatologically, you have water "piled" into the WPAC by the trade winds, and those waters are naturally warmer than those of the EPAC (both at the surface and subsurface) due to the downwelling that results from the aforementioned piling of water. Because those WPAC waters are so warm, relatively speaking, they enhance the convection there, which draws in air/strengthens the trade winds across the Pacific (and weakens the trades over the Indian Ocean for the same reason). This reinforces and intensifies this engine. It's literally nothing more than a giant, self-sustaining heat pump. This heat pump keeps chugging along until something "disrupts" its ability to convectively ventilate. In most cases, these disruptors are large MJO waves (powerful, semi-resonant perturbations to the global circulation), usually brought on by wavebreaking events the NH extratropics during boreal winter. When this convectively-driven heat pump is "disrupted", the trade winds piling water into the WPAC abruptly weaken, at which point there's nothing to hold the massive pile water in place. Therefore, it "sloshes" back eastward, into the central/eastern Pacific. This process is referred to as an "downweling oceanic kelvin wave", and it has a very large fluid inertia, thanks to the immense weight/gravitational potential energy of that mass of water behind it. So even if/when trades resume, the oceanic kelvin wave can continue on eastward, warming those waters/SSTs via downwelling. The kelvin wave it continues on eastward, warming the waters of the central/eastern Pacific, until it reaches the South American coast, at which point it reflects/refracts off the coast, retracting backwards (and poleward on either side), becoming what is generally referred to as an "oceanic rossby wave" and/or the "upwelling phase" of the oceanic kelvin wave. Now, if the Pacific SST warming (from the initial downwelling) is enough, it can affect the tropical convection/circulation enough to further disrupt the WPAC convection, which releases more water from the WPAC as the trade winds weaken further. This leads to more Kelvin waves and ocean warming through downwelling (and reduced evaporative cooling via reduced surface trade wind speeds). With time, the continuation of this process culminates in an "El Niño" event. The 1997/98 El Niño event was so strong, that instead it of having a mass of water piled into the WPAC, the thermocline was inverted such that the mass of water/warm pool was actually in the EPAC, rather than the WPAC. This was an amazing event. Just the amount of energy required to pull this off and sustain it was extraordinary. So, when that series of massive oceanic Kelvin waves refracted back westward/poleward in 1998, it was a similarly-massive swing in the flow of energy/fluid inertia. Aided by the antecedent trade winds (which weaken but sustain to some degree), the return phase of this Kelvin Wave quickly threw the system into a La Niña state. Great info Phil. I understood almost all of that. My gut feeling about the strong flip back to a Niña in 1998-99 was that it was some sort of backlash/overcorrection in the wake of the 1997/98 Niño. Nice to see that backed up somewhat.